One of the most ancient food preservation processes is dehydration. Now it comes with innovative, modern technology in the form of a food dehydrator. Removing moisture, the breeding ground of microorganisms, a food dehydrator offers triple action: slowing the growth of bacteria plus molds and yeasts as well as enzymatic action within the food. The health benefits of a food dehydrator range from preservation of food to retaining its nutritional value, giving the dried items a longer shelf life. Whether it’s a lunchbox snack, a hiking ration or a disaster survival kit, dehydrated food is 100% healthy and natural. Dehydrating food stuffs maintains its nutritional value along with other benefits such as decreasing weight and consequently storage space. This permits availability of seasonal produce throughout the year and ensures berries, beans, squash, root veggies or tropical fruits are available across the winter months. Dehydration of fruits and vegetables, meat produce and soups has an intrinsic nutritional value and this is perfect for physical health benefits, longevity and addressing nutritional deficiencies. A food dehydrator dries raw foods and removes moisture content from them. The dehydration is carried out at a very low and stable temperature, over an extended duration of time. This causes the food to retain most of its nutrients. Whether you boil, roast or fry food, cooking it at high temperatures destroys a significant proportion of the vitamins, enzymes and minerals contained by the food. Drying activates nuts, making healthy and crispy vegetables, fruit leathers, meat jerky and more takes just a couple of hours and the food remains fresh, nutritious and with a long shelf life. Another unique health benefit of a food dehydrator is that it is great for those growing or buying only organic produce. While organic fruits and vegetables have a lot of nutrients and essential vitamins, they have a short shelf life. Now, you can access the health benefits of these organic vegetables and fruits all the year round, using a food dehydrator. Drying food leads to preservation and protection of the nutritional content because moisture is removed and this prevents the chance of bacteria, mold or yeasts from thriving. While drying destroys a small percentage of nutrients, removing the water content leads to the concentration of what is left. This includes more dietary fiber and air resistant minerals and vitamins into a more compact space. A good example of the health benefits of this is the plum and its dried version, the prune. While the plum weighing 66 grams sans the pit has 6 mg vitamin C, the same amount of prunes have 1.3 mg of this vitamin. Before you jump to the conclusion that fresh is nutritious, remember that dehydrated food has less water as against fresh items. The weight reflects more solid content and a more potent concentrate of nutrients. Consequently, it is dried food which is most nutritious. Freeze dried, canned or frozen foods do not have the same nutritional content. Using a food dehydrator makes sense, if you are health conscious and seeking organic produce without additives and preservatives. 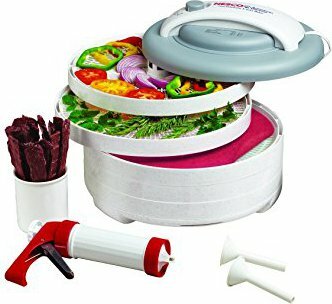 A food dehydrator therefore, dries fruits and vegetables in such a way that they contain more vitamins and minerals with each bite in a dense array of enzymes, nutrients and flavors. Retaining the nutritional content of food, it further reduces the alkaline content in fresh produce and prevents pathogens, (which are disease causing agents) from taking a hold of the foodstuffs. The food dehydrator yields the same food in the absence of 75% of its water content. Remaining moisture is then dried and to prevent any spoilage, the food is packed in airtight, moisture resistant jars, containers or bags like #10 cans. Storing the food in cool, dark and dry space will provide a longer shelf life as well as greater nutritional value. According to some estimates cereals can last for about 30 years if stored well after dehydrating. Dried veggies, pastas and fruits retain their nutritional value for up to 30 years while powdered milk or milk substitutes can remain stored nutritiously for up to 20 years! Dehydrating food can be traced to Biblical times. Now innovation and modern technology has spurred nutrition. Thin, easy to store and nutritious food material with vitamins and minerals present, is a healthy alternative to snacking on potato chips or ice cream. Dried vegetables are naturally low in LDL fats and high in fiber. As a result, no vitamin A is lost and vitamin C of a very small quantity leaves this food stuff once it is dehydrated. Minerals like selenium, magnesium and potassium are preserved. The rich concentration of enzymes and nutrients that are the result of even, consistent drying at a stable temperature in a food dehydrator can initiate positive health outcomes. An instance of how homemade dehydrated foods are way better than store snacks is the vegetable chips. Mixtures of dehydrated veggies, these vegetable chips are a tasty option to a packet of Lays high in MSG, sodium and other preservatives and additives. A single ounce of dehydrated vegetable chips with potatoes, tomatoes, beets and spinach has 134 calories. The calorie count of a one ounce serving of potato chips is 154. The mineral content of the vegetable chips is way more than the fried chips. Additionally, a single ounce of the veggie chips has 6.6 grams of fat while potato chips of the same amount equal 10.3 grams in fat. Using a dehydrator to remove moisture content from food creates food which tastes delicious and is a rich concentrate of nutrients. Another great plus is that since you are preparing the dehydrated items at home, you are aware of the quality and freshness of produce unlike store bought items. With a food dehydrator, leftover fruits and vegetables can be preserved and their life extended by as long as 2 years. This promotes healthy habits such as buying or making your own organic produce without worrying that the food will be wasted. Save food that would otherwise spoil and turn it into nutritious food like fruit leathers. Dehydrated foods can also undergo rehydration by adding them to liquid or semi-liquid food items like purees, sauces, pastas and casserole dishes. 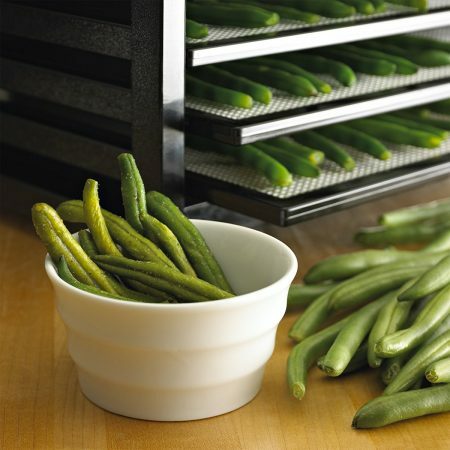 Dehydrating food needs a single ingredient, namely the food being dried. So there are zero chemicals, preservatives or additives. On the other hand, minerals and fibre of the whole fruit are retained unlike even healthier options like steaming, rather than frying. Dehydration changes the way one looks at food. Fruits and veggies can be transformed into snacks that are delicious and healthy. As against junk foods, you can make every type of nutritious snack from sultanas to dates in a food dehydrator. Encouraging and fostering healthy eating habits is a huge battle won on the road to good health. Store-bought fruits contain added sugars, trans fat and sulfur dioxide. These can lead to asthma, stomach pain and skin rashes. Control what goes into your food by opting for a food dehydrator. Meet your daily vegetable intake of 2-3 cups per day, as recommended by the US Department of Agriculture. Dehydrated grapes form raisin when 80% of their water is taken. The fruits that can be dehydrated are a natural choice for making trail mix or baking goodies with a lot of vitamins and minerals in them. Dehydrate any veggie for a healthy substitute for potato chips. Dehydration of food does not alter its calorie count. It’s just that calories aggregate together into a smaller compact mass without water (which does not have any calories). A more compact consumption of calories makes sense. Lose weight faster and remain at your optimal weight with calorie specific dehydrated foods. Fiber content of fruits, vegetables and other items does not change following dehydration. Water and fiber work in tandem to boost digestion. So taking in dehydrated foods with a regular glass of water can work its magic for your health and gastrointestinal digestion. Both soluble and insoluble fiber can result in better digestion and treatment for conditions like IBS. So, a food dehydrator could well be the way to fend off such GI conditions. Vitamins and minerals remain in dehydrated food or are lost to a minimal degree, as against other methods of food preservation. Sulfur used in the dehydration process, also protects vitamin C and A from being eliminated from food. An American Institute for Cancer research organization, AICR holds that dehydrated fruits have the same antioxidant phytonutrients as fresh fruits. Natural nutrients or plant based chemicals give fruits their healing power. While one serving of dried fruit has enough antioxidants to counter free radical damage, this can prevent diseases like cancer associated with such oxidative stress and damage. Dehydration process exposes food items to heat. But since the temperature is kept controlled, and stable, there is no resulting loss of nutrients. In contrast, conventional cooking causes loss of vitamins. Water soluble vitamins like B vitamins are especially essential for good health and are retained throughout the dehydration process. If you try drying food in the oven, it can lead to nutrient loss. This is because most ovens don’t have temperature gauges below 90 degrees. High heat destroys the nutrients. In contrast to this, complete control over food dehydration at low temperatures is an enduring feature of a food dehydrator. Adjustable thermostat range and a maximum temperature for meat products makes these food dehydrators ideal for creating fresh food which preserves living enzymes and nutrients, unlike extreme heating which depletes these from food. Now prepare food at just 46 degree C, which is the threshold degree of temperature where nutrients and enzymes are not lost. No other appliance in the market can match this. Now, inculcate healthy food habits with a food dehydrator that gives you the flexibility to store food in less space, cost efficiency in dehydrating food and portability to prepare your health foods anytime, anywhere. Dehydrated fruit roll ups, veggie chips, dried fruits, jerky that is preservative free with fresh spices and marinade and health alternatives such as flax seed pizza, activated nuts and seeds, healthy granola and treats– that is how diverse a range of health snacks a food dehydrator can prepare. Simple and quick to use, the dehydrator makes it impossible to over or under-dry food and makes it easy to rehydrate them too. With zero additives and preservatives, very low chances of spoilage due to bacteria or yeast and the safe nature of preservation, food dehydrators are even used by astronauts to rustle up some healthy snacks. Dangerous toxins can result if food becomes moist including E.coli and Salmonella typhi. Dangerous diseases like dysentery, typhoid and cholera can result. Companies may be using excessive drying, preservatives or quick harsh drying leaving the core moist, because of which food does not only lose its nutritional value, but also becomes a hazard for your health. A food dehydrator eliminates all these worries, when it comes to preserving good health. Homemade dehydrated foods are even better than fresh or marketed equivalents. A food dehydrator sharpens the taste, and retains the color, aroma and nutritive value of food in a way commercial preservatives just cannot. This is why food dehydrators have become so popular. Healthy and nutritious treats are the reason why nutritionists and dietitians alike recommend this appliance. 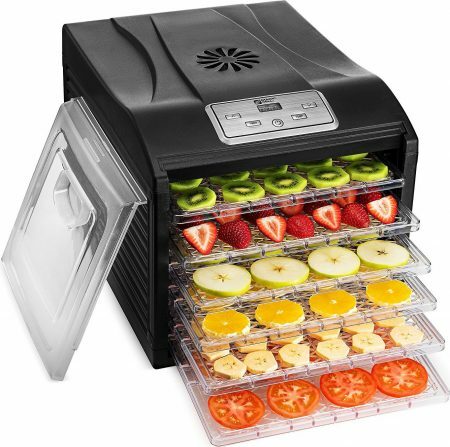 Multiple health benefits such as weight loss, countering nutritional deficiencies and enjoying healthier snacks make the food dehydrator an excellent investment. 40–60 percent nutrient loss as moisture expands when freezing takes place. This causes the rupture of food cells. This means lower than 5% nutrient loss for dehydrated foods on portions of any size as against a 40 to 80 percent loss in freezing or canning foods, makes the food dehydrator the healthiest option. Dehydrated food loses 70 to 95 percent of its weight because water is removed. But the nutritional value shoots up as a percent of the lowered weight. 3 grams of protein per serving, 13% of daily iron and 18% of daily needs for potassium. 244% of your daily needs for vitamin C Additionally it has 3.2 grams of protein and is rich in riboflavin. Calcium, magnesium, potassium and manganese. 34% of daily vitamin A needs and 18% of iron recommendations, rich in potassium, niacin and copper. Dried foods take 1/6th of their original space for storage and do not require a fridge or freezer. Insect proof, air-tight plastic or canning jars or even glass jars or vacuum seal bags will do. Heat, liquid and moisture, in fact, destroy food and lead to their deterioration. Green organic produce that is dehydrated limits microbes and increases nutritional value. A food dehydrator optimizes the drying process, allowing for even, low heat that channels the natural nutrients of the food and preserves these. Along with a long shelf life comes immense nutritional value, providing a variety of health benefits. From warding off diseases to gaining good health, food dehydrators are a gift for the health, quality and budget conscious consumers.